I do have one of Max Factor's lipsticks somewhere in my collection (although I can't currently find it) but it's not one I tend to reach for. There's nothing wrong with it as such, it just doesn't really stand out against other lipsticks in my collection and so tends to be neglected. This will all be changing when it comes to Max Factors new Marilyn Monroe collection*. L'Oreal lead the way with collections of lipsticks featuring shades designed to suit different skin tones with each shade named after a famous female who has the corresponding skin tone for that shade. Max Factor have followed this with a four piece collection of reds inspired by the iconic red lip wearer Marilyn Monroe. The shades have undertones of orange, blue and purple to work in harmony with cool, warm and dark skin tones. 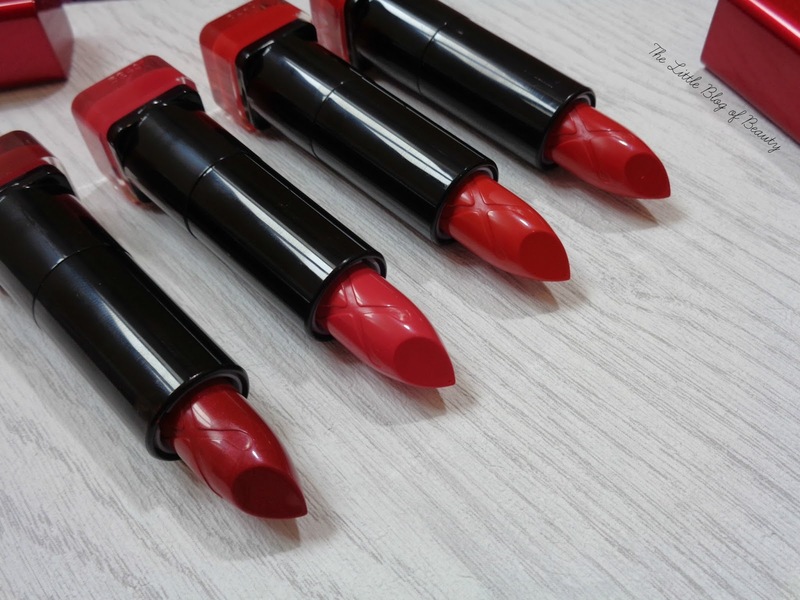 I'm not quite sure if Ruby red is actually the shade that Marilyn Monroe wore but if not this is inspired by her chosen shade and is a bold, true red. Sunset red is designed for warm or dark skin tones and is a burnt orange red. 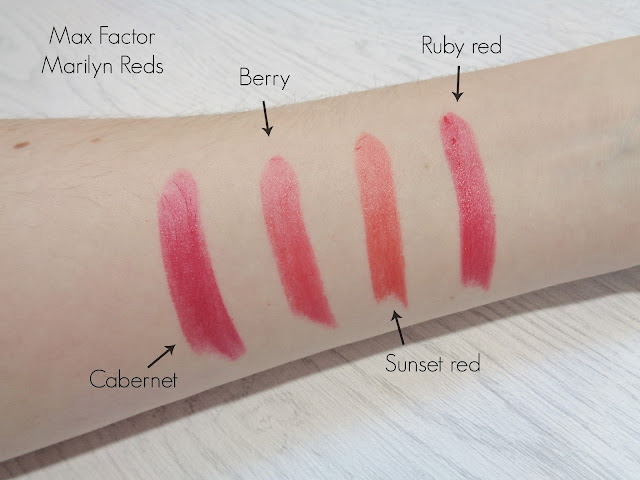 Berry has a blue undertone and so is designed to suit cool or pale skin tones and finally Cabernet is a rich deep red with purple undertones for darker skin tones. Cabernet is the only shade that contains a red shimmer. I've only tried two shades and those are the two that instantly appealed to me when I first received them. Unsurprisingly these are Ruby red and Berry, the two shades most suited to pale skin tones. 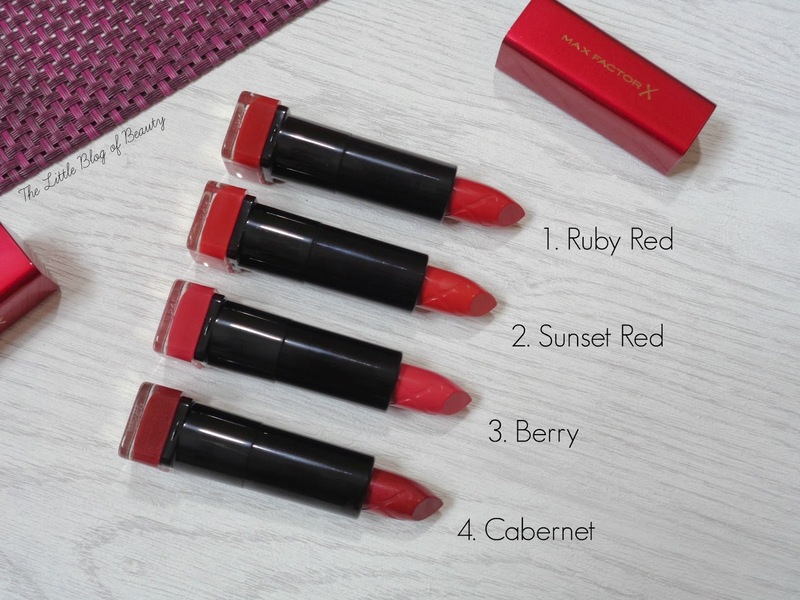 I will give the other two a try but I'm personally not keen on orangey reds such as Sunset red and I think Cabernet might be a little too dark for me. The first thing I noticed the first time I applied one is the unusual scent. I couldn't quite place it at first but would describe it as 'fizzy'. I've learnt that me describing a scent as fizzy means a citrus note and upon checking my press release I discovered the formula has been enriched with fresh citrus notes and vanilla undertones. Some people may not be keen but I personally love it and if I remember correctly I believe this does linger on the lips for a while. 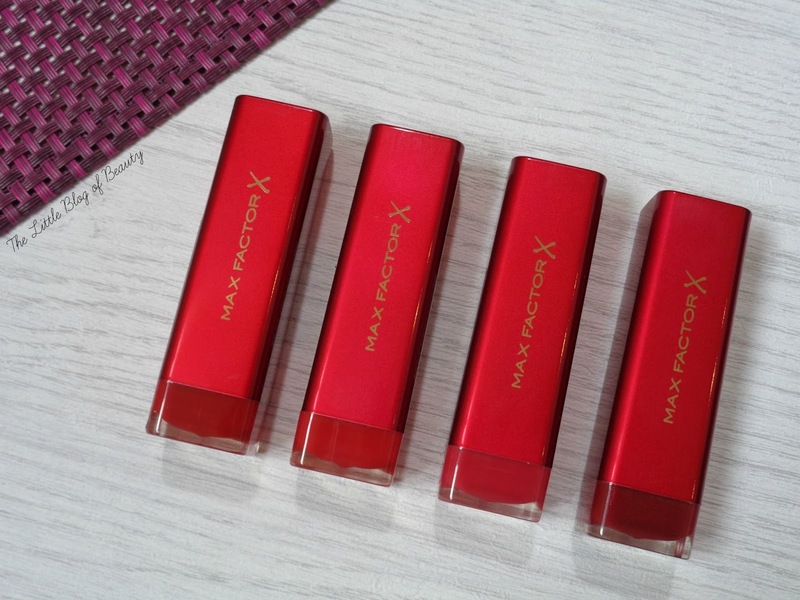 I was expecting the formula to be a little on the dry side, as that was my previous experience of Max Factor lipsticks, but I was delighted to find that these are far from dry. They have a gorgeous buttery soft formula that glides onto lips with ease and applies beautifully. That's probably because the formula contains grapeseed oil and avocado butter to prevent lips from drying pout over time. I honestly love applying these lipsticks! The finish isn't particularly glossy but they're not matte either, they're somewhere in between; I guess you'd call it satin really. I wasn't sure that these would particularly last well either but again I was pleasantly surprised. If you're doing a lot of eating or drinking then I think you'd need to reapply once you've finished, but if you're going light on the eating or drinking I could see these pushing towards the four hour mark before you might want to have a touch up. They also leave a stain on the lips (and my arm) which I think really helps when it comes to the colour sticking around. I love these lipsticks and can see me getting a lot of use out of Ruby red and Berry. For just £7.99 each I'd recommend getting yourself down to Boots and grabbing a couple, especially as Max Factor is currently on 3 for 2. Which red would you chose from the Marilyn collection? it's great that these last so well but a bit of a shame that they can be drying! These look gorgeous! Need to pick them, a girl can never have too many red lipsticks! I can't stand lipsticks with strange scents! The Rimmel Apocolips ones are similar to these in smell I've heard and they make me feel ill! Other than that the colours look amazing and I love the packaging! Sunset Red is beautiful, even if I would be too pale for it!